After announcement of Tableau 8.1 ( and completion of TCC13) this week people asked me to refresh my comparison of leading Data Visualization tools and I felt it is the good time to do it, because finally Tableau can claim it has 64-bit platform and it is able now to do more advanced Analytics, thanks to Integration with R (both new features needs to be benchmarked and tested, but until my benchmarks are completed I tend to believe to Tableau’s claims). I actually felt that Tableau may be leapfrogged the competition and now Qlikview and Spotfire have to do something about it (of course if they care). In fact the “keynote propaganda” from Christian Chabot and Chris Stolte was so close to what I am saying for years on this blog, that I used their slogan FEBA4A (“Fast, Easy, Beautiful, Anywhere for Anyone”) as the filter to include or remove from comparison any runner-ups, traditional, me-too and losing tools and vendors. For example despite the huge recent progress Microsoft did with its BI Stack (updates in Office 2013, 365 and SQL 2012/14 of Power Pivot/View/Map/Query, SSAS, Data Explorer, Polybase, Azure Services, StreamInsight, in-Memory OLTP, Columnstore Indexing etc.) did not prevent me from removal of Microsoft’s BI Stack from comparison (MSFT still trying to sell Data Visualization as a set of add-ins to Excel and SQL Server as oppose to separate product), because it it is not FEBA4A. For similar reasons I did not include runner-ups like Omniscope, Advizor, Panopticon (it is part of Datawatch now), Panorama, traditional BI vendors, like IBM, Oracle, SAP, SAS, Microstrategy and many me-too vendors like Actuate, Pentaho, Information Builders, Jaspersoft, Jedox, Yellowfin, Bime and dozens of others. I even was able finally to rule out wonderful toolkits like D3 (because they are not for “anyone” and they require brilliant people like Mike Bostock to shine). Also one of visitors indicated to me that current pricing for 8 core Tableau 8.0 license for 1st year is $240K now plus (mandatory?) 20-25% maintenance for 1st year… However negotiations are very possible and can save you up to 20-25% of “discount”. I am aware of recent cases where 8-core license was sold (after discount) for around $195K with maintenance for 1st year for about $45K so total sale was $240K with 1st year maintenance (25% growth in price for last 3 years). Please note that I did not quantify above which of 3 tools are better, it is not possible until I will repeat all benchmarks and tests (I did many of those in the past; if I will have time in the future, I can do it again) when actual Tableau 8.1 will be released (see latest here: https://licensing.tableausoftware.com/esdalt/ ). However I used above the green color for good and red color for bad (light-colored backgrounds in 3 middle columns indicated good/bad). Also keep in mind that Qliktech and TIBCO may release something new soon enough (say Qlikview 12 or they called it now Qlikview.Next and Spotfire 6), so leapfrogging game may continue. Update 10/11/13: interesting article about Tableau (in context with Qlikview and Spotfire) by Akram Annous from SeekeingAlpha: http://seekingalpha.com/article/1738252-tableau-a-perfect-short-with-a-catalyst-to-boot . Akram is very active visitor to my blog, especially to this article above. This article only 1 month old but already needs updates due recent pre-announcements about Qlikview.Next (Qlikview 12) and Spotfire 6, which as I predicted showing that leapfrogging game continue at full speed. Akram is brave enough by “targeting” pricing for DATA shares as $55 IN 30 DAYS, $35 IN 6 MONTHS. I am not convinced yet. Thanks, Andrei, for doing this comparison. It was helpful when I chose Tableau in 2011, and something I still find interesting and valuable to read. Although not a feature, I think price is an important factor when deciding which product to choose. The lower the price, the more it will be used. I am fond of Tableau, but think their (server) license is expensive. That said, I think Tableau actually offers the lowest price of the 3 products compared! … and probably also the lowest total cost of ownership. I know it is not easy to compare license cost since because most or all of them choose to hide them. This is understandable when the price is high. Thanks for the pricing links. 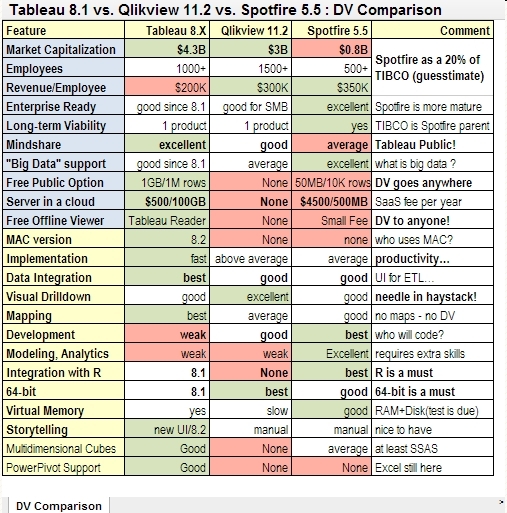 I am glad to see that QlikView chooses to be open in this regard and hope Tableau and SpotFire will do the same. If I remember correct, I saw a core server price 10 months ago or so, (which was way too high for the company I work) but can’t find it. Even if I did find it, I wouldn’t share, because I want Tableau Software to share their prices themselves, and hope they will not only do so, but also be more flexible in their licensing. My friend provided me with additional pricing info for Tableau Server Core Licensing: “8 core server (enough to support 1,000 users, or 100 concurrent) for Tableau is $180k first year, about $34k every year after year 1 for maintenance”. With 8 core licensing I actually witnessed support for more then 1000 users: 1300+ active Interactors, 250+ Publishers, 3000+ Viewers. I also witnessed more than once that negotiation with Tableau Sales can get you down to $160K or even less for 8 Core license with 20% every year after year 1 for maintenance (so total about $192K). In 2013 price for the same configuration went 20-25% up, probably (after negotiated discount) somewhere around $240K total for 8-core license with 1 year maintenance. I don’t see the comparison in Chrome. Anyone else having issues seeing it? I tested it with 5 browsers (latest versions) and it is visible with Chrome, IE, Firefox 24 and Opera, but not in Firefox 23 and earliest and Safari. I temporary added a screenshot of comparison, so you can see it regardless of your browser and its version. I would like to provide you an update on the Tableau Server costs. Tableau’s currently offers the 8 core server license (Production server including an additional Development and QA Server) for 299.000 USD before negotiation and discount. Negotiation can save up to $60000 of that price (basically 20-25% of initial asking price) and reduce the total to approx. $240000 (that Tableau Server discounted cost includes the first year of service/maintenance). Before version 8.0 it was offered for 275.000 USD until beginning of 2013.
thanks for this comparison, quite insightful for me as a QlikView user. My comment is that QlikView can be downloaded for free, so there is free option, if that’s what you meant. Free Qlikview you mentioned is only good for learning otherwise it is useless, because you cannot open any .QVW files except yours produced with this particular copy/instance of Qlikview Personal Edition. Thank for your contribution to the sometime opaque world of software vendors functionality and pricing. With the new pressure of producing results publicly every 13 weeks, Tableau’s pricing models for list price numbers go out the window on or about week 11 of the quarter. That eternal hockey stick trend is not new and applies to all s/ware vendors that are publicly held. I pass on these observations about this commentary. I see less and less of Spotfire and shortlists with just Tableau and Qlikview. I have been running Tableau’s 8.1 beta and now production for 8 weeks. 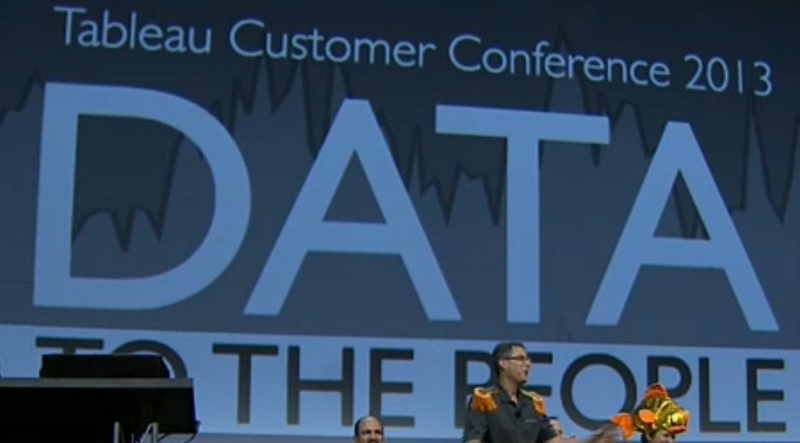 The desktop additions are helpful especially for the statistical crowd which is a subset of the Tableau world at best. Frankly, the addition of bubble charts and tree-maps were not ground breaking or hot items after training many clients since the 8.0 release. In my view server 8.1 is more important than anything Tableau has released since going public. Features like single sign on is very telling – in a few words, this takes Tableau out of the realm of a complementary offering to your SAP/Business Objects implementation to we are here to replace that offering and other enterprise reporting systems. Let me add on more perspective on Tableau…..support. I pushed the 8.1 beta to the wall and Tableau would pick up my post when a problem arose at 6AM EST by UK staff and would hand off to support in Seattle without loss of continuity. The after purchase experience is important to all clients.